Custody hails from Finland and I feel that is worth mentioning as it's been a while since I featured a band from this part of Europe. In the 90's and early 2000's, there were a slew of bands from the Sweden, Norway and Finland region that were in constant rotation. Starmarket, Chester Copperpot, Manifesto Jukebox, Him Kerosene, Beezwax, the list goes on and on. Then something happened. I'm not sure if the music scene changed over there or if I gradually fell out of touch as I got old. If anyone out there knows of great bands from this area that I have been overlooking, please get in touch and let me know. Anyway, back to Custody. These guys are playing a really great version of melodic punk rock. So much of this kind of music can be traced through influences that will eventually lead you back to Jawbreaker or Leatherface. As a super generic comparison, I'd say Jawbreaker is a more appropriate starting point, but to me Custody really falls into the branch of punk rock that bands like Iron Chic and to some extent RVIVR are existing in. The vocals are impassioned and somewhat gruff. There's a heart-on-your-sleeve vibe here that never falls into schmaltzy emo trappings, but makes the songs more engaging and feel more honest. Musically, there's guitar octaves in all of the right places, some stutter stops in the breaks and most important to me, giant catchy choruses. 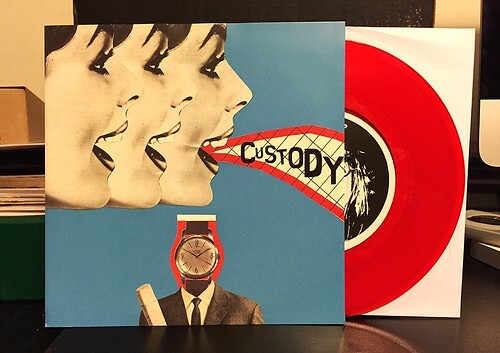 It's a great introduction to Custody and I'm very eager to hear some more out of these guys.